Ald. 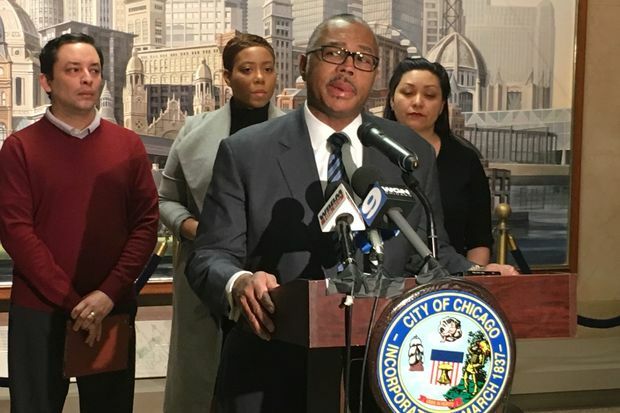 Howard Brookins (21st) led a City Hall press conference Thursday to call on Gov. Bruce Rauner to negotiate a new contract with state employees represented by the American Federation of State, County and Municipal Employees Council 31, whose membership has authorized a strike. CITY HALL — Ald. Howard Brookins (21st), injured in a freak accident when a squirrel jumped in his bicycle's spokes, returned to the limelight at City Hall Thursday — despite still needing extensive dental work and at least one more surgery. Although he attended the January and February City Council meetings, Brookins kept a low profile since he was injured while riding his bicycle Nov. 13 along the Cal-Sag Trail when a squirrel became caught in the spokes of his wheel and he was flung over the handlebars. "I don't like hearing myself talk," Brookins said, adding that he is also self conscious about the scar on his nose. A photo Brookins posted on Facebook shows the mangled squirrel still stuck in his bicycle's front wheel. Despite his lingering discomfort, Brookins led a City Hall press conference Thursday to call on Gov. Bruce Rauner to negotiate a new contract with state employees represented by the American Federation of State, County and Municipal Employees Council 31, whose membership has authorized a strike. "I want to call attention to this dispute, which has hurt my community," Brookins said. Brookins' ward includes Auburn Gresham, Washington Heights, Gresham, Chatham and Roseland. Even though the alderman was wearing a helmet when he crashed, he "landed on his face," Brookins said. Brookins' carbon frame bicycle has been repaired, but he hasn't been back on two wheels yet. "I'm signed up for Bike the Drive, but my wife isn't real happy about that," Brookins said. "She just wants me to get fat and happy." During the City Council's budget hearings in October, Brookins asked city officials to do more to fight the "aggressive squirrels" that he said were eating through refuse carts in his ward and creating a nuisance — and a serious expense for city officials. His new No. 1 priority at City Hall? "Ban squirrels," Brookins said, laughing.